31 A None No Power Seat 31 A is a standard Premium Economy Class seat however, the proximity to the lavatory and galley may be bothersome. 31 C None No Power Seat 31 C is a standard Premium Economy Class seat however, the proximity to the lavatory and galley may be bothersome. 31 D None No Power Seat 31 D is a standard Premium Economy Class seat however, the proximity to the lavatory and galley may be bothersome. 31 E None No Power Seat 31 E is a standard Premium Economy Class seat however, the proximity to the lavatory and galley may be bothersome. 31 F None No Power Seat 31 F is a standard Premium Economy Class seat however, the proximity to the lavatory and galley may be bothersome. 31 G None No Power Seat 31 G is a standard Premium Economy Class seat however, the proximity to the lavatory and galley may be bothersome. 31 H None No Power Seat 31 H is a standard Premium Economy Class seat however, the proximity to the lavatory and galley may be bothersome. 31 J None No Power Seat 31 J is a standard Premium Economy Class seat however, the proximity to the lavatory and galley may be bothersome. 31 L None No Power Seat 31 L is a standard Premium Economy Class seat however, the proximity to the lavatory and galley may be bothersome. 37 C None No Power Seat 37 C is a standard Premium Economy Class seat. 37 H None No Power Seat 37 H is a standard Premium Economy Class seat. 37 L None No Power Seat 37 L is a standard Premium Economy Class seat. 38 A None No Power Seat 38 A is a standard Economy Class seat that has extra legroom due to the position of the bulkhead. The tray table is in the armrest, making the armrest immovable and slightly reducing the seat width. There is no floor storage for this seat during takeoff and landing. 38 C None No Power Seat 38 C is a standard Economy Class seat that has extra legroom due to the position of the bulkhead. The tray table is in the armrest, making the armrest immovable and slightly reducing the seat width. There is no floor storage for this seat during takeoff and landing. 38 D None No Power Seat 38 D is a standard Economy Class seat that has extra legroom due to the position of the bulkhead. The tray table is in the armrest, making the armrest immovable and slightly reducing the seat width. There is no floor storage for this seat during takeoff and landing. 38 E None No Power Seat 38 E is a standard Economy Class seat that has extra legroom due to the position of the bulkhead. The tray table is in the armrest, making the armrest immovable and slightly reducing the seat width. There is no floor storage for this seat during takeoff and landing. 38 F None No Power Seat 38 F is a standard Economy Class seat that has extra legroom due to the position of the bulkhead. The tray table is in the armrest, making the armrest immovable and slightly reducing the seat width. There is no floor storage for this seat during takeoff and landing. 38 G None No Power Seat 38 G is a standard Economy Class seat that has extra legroom due to the position of the bulkhead. The tray table is in the armrest, making the armrest immovable and slightly reducing the seat width. There is no floor storage for this seat during takeoff and landing. 38 H None No Power Seat 38 H is a standard Economy Class seat that has extra legroom due to the position of the bulkhead. The tray table is in the armrest, making the armrest immovable and slightly reducing the seat width. There is no floor storage for this seat during takeoff and landing. 38 J None No Power Seat 38 J is a standard Economy Class seat that has extra legroom due to the position of the bulkhead. The tray table is in the armrest, making the armrest immovable and slightly reducing the seat width. There is no floor storage for this seat during takeoff and landing. 38 L None No Power Seat 38 L is a standard Economy Class seat that has extra legroom due to the position of the bulkhead. The tray table is in the armrest, making the armrest immovable and slightly reducing the seat width. There is no floor storage for this seat during takeoff and landing. 47 A None No Power Seat 47 A is a standard Economy Class seat. Its proximity to the lavatories may be bothersome. 47 C None No Power Seat 47 C is a standard Economy Class seat. Its proximity to the lavatories may be bothersome. 47 D None No Power Seat 47 D is a standard Economy Class seat. Its proximity to the lavatories may be bothersome. 47 E None No Power Seat 47 E is a standard Economy Class seat. Its proximity to the lavatories may be bothersome. 47 F None No Power Seat 47 F is a standard Economy Class seat. Its proximity to the lavatories may be bothersome. 47 G None No Power Seat 47 G is a standard Economy Class seat. Its proximity to the lavatories may be bothersome. 47 H None No Power Seat 47 H is a standard Economy Class seat. Its proximity to the lavatories may be bothersome. 47 J None No Power Seat 47 J is a standard Economy Class seat. Its proximity to the lavatories may be bothersome. 47 L None No Power Seat 47 L is a standard Economy Class seat. Its proximity to the lavatories may be bothersome. 48 D None No Power Seat 48 D is a standard Economy Class seat that has extra legroom due to the exit however, the proximity to the lavatories may be bothersome. The tray table is in the armrest, making the armrest immovable and slightly reducing the seat width. There is no floor storage for this seat during take-off and landing. The proximity to the lavatories may be bothersome. 48 E None No Power Seat 48 E is a standard Economy Class seat that has extra legroom due to the exit however, the proximity to the lavatories may be bothersome. The tray table is in the armrest, making the armrest immovable and slightly reducing the seat width. There is no floor storage for this seat during take-off and landing. The proximity to the lavatories may be bothersome. 48 F None No Power Seat 48 F is a standard Economy Class seat that has extra legroom due to the exit however, the proximity to the lavatories may be bothersome. The tray table is in the armrest, making the armrest immovable and slightly reducing the seat width. There is no floor storage for this seat during take-off and landing. The proximity to the lavatories may be bothersome. 48 G None No Power Seat 48 G is a standard Economy Class seat that has extra legroom due to the exit however, the proximity to the lavatories may be bothersome. The tray table is in the armrest, making the armrest immovable and slightly reducing the seat width. There is no floor storage for this seat during take-off and landing. The proximity to the lavatories may be bothersome. 48 H None No Power Seat 48 H is a standard Economy Class seat that has extra legroom due to the exit however, the proximity to the lavatories may be bothersome. The tray table is in the armrest, making the armrest immovable and slightly reducing the seat width. There is no floor storage for this seat during take-off and landing. The proximity to the lavatories may be bothersome. 49 A None No Power Seat 49 A is a standard Economy Class seat with extra legroom due to the exit row in front. 49 C None No Power Seat 49 C is a standard Economy Class seat with extra legroom due to the exit row in front. 49 J None No Power Seat 49 J is a standard Economy Class seat with extra legroom due to the exit row in front. 49 L None No Power Seat 49 L is a standard Economy Class seat with extra legroom due to the exit row in front. 58 H None No Power Seat 58 H is a standard Economy Class seat however, other flyers tend to bump into this seat. 59 D None No Power Seat 59 D is a standard Economy Class seat that may have reduced under seat leg and storage space due to the misalignment with the row ahead. 59 E None No Power Seat 59 E is a standard Economy Class seat that may have reduced under seat leg and storage space due to the misalignment with the row ahead. 59 F None No Power Seat 59 F is a standard Economy Class seat that may have reduced under seat leg and storage space due to the misalignment with the row ahead. 59 H None No Power Seat 59 H is a standard Economy Class seat that may have reduced under seat leg and storage space due to the misalignment with the row ahead. 61 C None No Power Seat 61 C is a standard Economy Class seat whose proximity to the lavatories may be bothersome. 61 J None No Power Seat 61 J is a standard Economy Class seat whose proximity to the lavatories may be bothersome. 62 A None No Power Seat 62 A is a standard Economy Class seat in the last row of the aircraft whose proximity to the lavatories and galleys may be bothersome. 62 C None No Power Seat 62 C is a standard Economy Class seat in the last row of the aircraft whose proximity to the lavatories and galleys may be bothersome. 62 F None No Power Seat 62 F is a standard Economy Class seat in the last row of the aircraft whose proximity to the lavatories and galleys may be bothersome. 62 H None No Power Seat 62 H is a standard Economy Class seat in the last row of the aircraft whose proximity to the lavatories and galleys may be bothersome. 62 J None No Power Seat 62 J is a standard Economy Class seat in the last row of the aircraft whose proximity to the lavatories and galleys may be bothersome. 62 L None No Power Seat 62 L is a standard Economy Class seat in the last row of the aircraft whose proximity to the lavatories and galleys may be bothersome. Business and Premium Economy seats have AVOD entertainment systems with audio and video. Economy class offers audio entertainment in both English and Chinese. Business and Premium Economy seats have AVOD entertainment systems with audio and video. Economy class offers shared programming in both Chinese and English. Business and Premium Economy seats have universal power ports located adjacent to the A/V control handset. There is no power in Economy. Wireless internet is enabled on this aircraft, providing web access for an additional fee during your flight. Food service is available on all medium to long-haul flights. 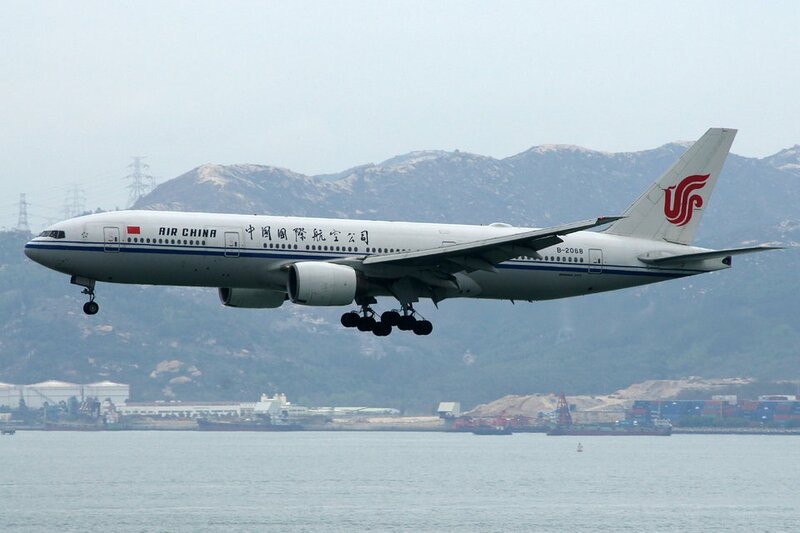 Air China's Boeing 777-200 is a 3-class aircraft that seats a total of 310 passengers. This aircraft has 30 angled flat Business Class seats, 63 Premium Economy seats, and 217 standard Economy seats. All seats on row 11 have more movable space on the little "hole". Normally when you are lie down flat and sleep your feet can't be extended since the hole is just enough to fit your feet. The front rows are normally not filled as the flight attendants like to use it as a float spot to jump from side to side of each cabin. Air China flies 1 versions of Boeing 777-200.